Ableton Live Pack made from samples of the Moog Sub Phatty Analog Synthesizer. 20 instrument rack presets designed for bass but capable of all kinds of sounds. Includes 7 Audio Effect Racks especially for bass. The Moog Sub Phatty is capable of some earth-shaking low end. There's really nothing quite like the bass on a Moog synthesizer. Now that power has been captured in Instrument Racks for Ableton Live. 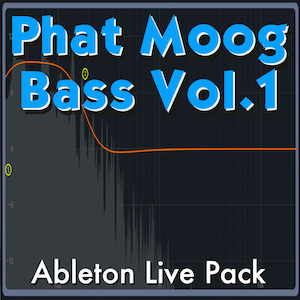 The Phat Moog Bass Ableton Live Pack Volume 2 picks up where the 1st Volume left off. More bass sounds, each one uniquely programmed on the Moog and sampled into Ableton Live. You also get some useful Audio Effect Racks to help you get the most out of each sound. Check out the video below to hear it in action! Exploring the Moog Sub Phatty never gets old. As I've grown more comfortable and familiar with this synth, I've found some new and interesting sounds. Over the past few months I've made it a point to sample some of the more exciting patches and create Ableton Live Instrument Racks. Ableton Live 9.5 now has some really awesome analog modeled filters, and these new instruments take advantage of them! In addition, I've also created some very useful Audio Effect Racks. While they were designed for these particular instruments, you can use them on any sound you want. It's just another tool to help you make the perfect bass for your music. Check out the First Volume of the Phat Moog Basses. The first collection of Phat Moog Basses has been a huge hit with Ableton Live producers. If you can't get enough of that unique sound, be sure to check out the Volume 1! 40 Instrument Racks designed for Bass. Sampled from Moog Sub Phatty analog synthesizer.